Delight the gourmand on your list with this unique combination of meats and cheeses. The selection includes such taste sensations as Napoli salami, Oregonzola® Blue Cheese from our neighbors at the Rogue Creamery, and lemon dill smoked salmon. 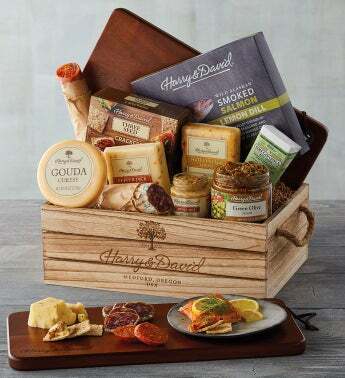 This delicious collection arrives in a rustic wooden crate with a convenient acacia wood serving tray.